Since it is Halloween time what would it be without talking about some scary and haunted Chicago sites! Some people like to say that Chicago is one of the most haunted cities in the world. I'm not sure about that one but it definitely has it's own share of haunted historical sites. Built in 1893 as part of the World Colombian Exposition, the Palace of Fine Arts (now the Museum of Science and Industry) is the only surviving building from the Fair. Supposedly there are three ghosts that haunt it. Clarence Darrow is probably the most famous of the ghosts. He was the lawyer for Leopold and Loeb during their 1924 murder trial, in addition to being a part of the Scopes Monkey Trial. After Clarence died he was cremated and his ashes were spread over the Jackson Park Lagoon. Since then people have said that they have seen him on the bridge along with a gentleman matching his description in 1930's clothes in the museum itself who then vanishes. I have been to the MSI many times and all that I've felt is super overwhelmed by all the little kids running around. 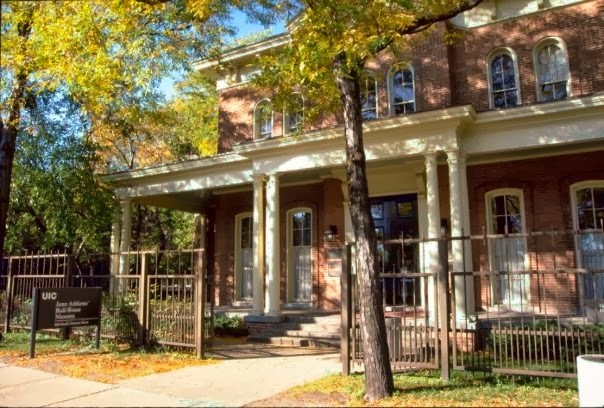 There are multiple stories about the west side Hull House being haunted. Some of the stories are even before Jane Addams bought the home. Supposedly Mrs. Hull, wife of the original owner, walks the house at night. People claim to have seen a woman in the windows of the home. Not only is there Mrs. Hull but supposedly there was also a devil baby brought to Hull House. Supposedly a devil baby was born near the house and was brought to the house to try and have it baptized. Like Mrs. Hull people claim to see the face of a baby in and around the house. I can't say either way about Hull House, I haven't had a chance to visit the museum yet. Since Jane Addams was a big fan of supernatural stories I feel like maybe they went where they were appreciated! Since these are two of the biggest museums in the Chicago area I thought maybe there would be a ton of stories about them being haunted by all sorts of crazy things. Weirdly enough with all my research I could only find a couple of small stories. I found one claim of the Field Museum being the most haunted place in Chicago, if that was the case the then more people would be talking about it being haunted!! Supposedly there is a "Screaming Mummy" that can be heard when the museum is closed. I feel like this one is not totally out of the realm of possibilities since there are quite a number of mummies on display and in storage, who knows what ancient occult could be still attached to them. For all my research I was able to find one story of a guard at the Art Institute who saw a specter in the Japanese galleries. It was written up as a PR story by the Art Institute though so who knows! Overall I feel like since I've at least walked the back halls of the Field Museum and yes they're sorta creepy and old but I'm not sure I'd go so far as to say haunted but who knows when you're surrounded by mummies, and the dead animal zoo. Lucky for you guys Stephanie got into the haunting spirit as well! Obviously you can't talk about haunted places in Chicago without coming across a few (or a lot) of bars so be sure to check out her thoughts about some of Chicago's haunted watering holes. Awesome recap! I love hearing about all the old haunted places in a city. These all seem so creepy!